Active Kyds Clear Safety Glasses with Built in Side Shields are manufactured to safety standards: ANSI Z87.1 and CE. Those are requirements set by the U.S. for impact resistance and UV protection. These child safety glasses not only work perfectly with a construction costume for pretend play or role play for kids, but these can also be worn for eye protection. 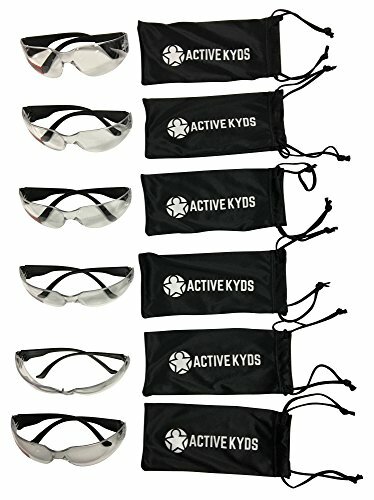 If your child likes to play with Nerf guns for BB guns (under adult supervision of course), these glasses are recommended to be used for shielding their eyes against rogue BB's or pieces of unintended shrapnel. Please keep your children's vision protected and add this to your cart now! Thank you for your business! If you have any questions about this product by Active Kyds, contact us by completing and submitting the form below. If you are looking for a specif part number, please include it with your message.